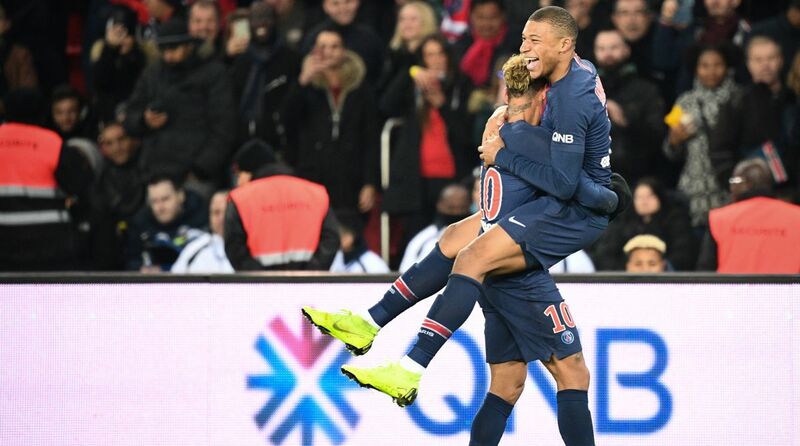 Kylian Mbappe and Edinson Cavani both scored hat-tricks as Paris Saint-Germain romped to their biggest-ever home win with a 9-0 Ligue 1 thrashing of Guingamp. The runaway league leaders exacted sweet revenge on bottom club Guingamp, who had ended their bid for a sixth straight League Cup title earlier this month in Paris. It was PSG’s largest victory at the Parc des Princes, beating an 8-0 win over Dijon 12 months ago, but fell narrowly short of equalling their biggest win in total — a 10-0 French Cup thumping of Cote Chaude in 1994. The capital club, who lead second-placed Lille by 13 points with two games in hand, have dropped just four points in their opening 19 matches of the season as they bid for an unbeaten league campaign. Neymar also scored twice as PSG’s front three took their combined tally for the season to 58 goals, while Mbappe extended his advantage in the Ligue 1 scoring charts having netted 17 times in only 14 appearances. Coach Thomas Tuchel did see Marco Verratti forced from the field with what he later described as a “serious injury”, with the Italian now a doubt for PSG’s Champions League last-16 tie against Manchester United next month. PSG wasted little time in forging ahead, with a wonderful 11th-minute goal by Neymar doing the damage. His former Brazil international team-mate Dani Alves picked out the world’s most expensive player with a sumptuous pass over the top, and Neymar flicked the ball over Guingamp right-back Jordan Ikoko and slotted in his 19th goal of the season. Neymar was involved as PSG all but ended the game as a contest eight minutes before half-time, playing a neat one-two with Mbappe which allowed the World Cup winner to side-foot into the corner of the net. Mbappe added another goal on the stroke of the interval, as Cavani’s pass found him in acres of space inside the Guingamp box. The game was even more one-sided after the restart, with Cavani tapping in Juan Bernat’s low cross just before the hour mark, before nodding Di Maria’s swinging delivery past helpless Guingamp goalkeeper Marc-Aurele Caillard. Guingamp were totally unable to deal with the reigning champions, as Mbappe sent Neymar racing clear to slide the ball under Caillard in the 68th minute. Cavani won the three-man race to a hat-trick by miskicking a rebound in off the post, with the goal awarded by VAR, before the Uruguayan’s square pass was diverted into an empty net by Mbappe to seal his own treble. There were still 10 minutes remaining as PSG looked to match their record winning margin, and full-back Thomas Meunier got in on the act to make it nine in the 83rd minute. A lack of injury-time was the telling factor in the hosts’ failure to reach double figures, as Guingamp desperately clung on to avoid further ignominy. “We were drowned, we made beginners’ mistakes,” bemoaned Guingamp coach Jocelyn Gourvennec. Thierry Henry’s nightmare spell in charge of Monaco took another turn for the worse as Cesc Fabregas gifted Strasbourg a goal and fellow new signing Naldo was shown a seventh-minute red card in a 5-1 home humbling. Brazilian veteran Naldo was harshly dismissed for a slight tug on Ludovic Ajorque, who went on to score twice in a one-sided game. Adrien Thomasson, Youssouf Fofana and Ibrahim Sissoko also found the net for Strasbourg, the latter with a stunning long-range effort after Fabregas carelessly conceded possession inside his own area, with Radamel Falcao’s 22nd-minute strike barely a consolation. The principality outfit remain stuck in the bottom two, three points from safety and without a home league win all season. Elsewhere, Patrick Vieira’s Nice snatched a 1-1 draw at Reims as Remi Walter scored a controversial VAR-awarded penalty in the 99th minute.